The importance and status of molding machinery in founding can be explained as follows in accordance with H. Lohse: “Molding machines are machine tools in the field of sand molding that use tools (pattern plate, core box) to produce the workpieces (mold parts, mold halves, mold cods, cores) from required materials (molding material, core molding material)”. A frequently used classification method is to differentiate machines by the principle of molding material compaction with additional subdivision by one-stage compaction processes (e.g. squeeze molding, pulsed compaction) and two-stage compaction processes (e.g. blow, shoot, vacuum, and air flow squeezing. As shown by field experience, bentonite-bonded moulding sand exhibits higher post-squeezing compressive strength (= mould strength) on the side on which the squeezing force was applied than on the opposite side. The mould strengths measured are proportional to the forces acting at each location. The schematic illustration at Fig. 1 (Künkel Wagner Germany GmbH) illustrates this effect. 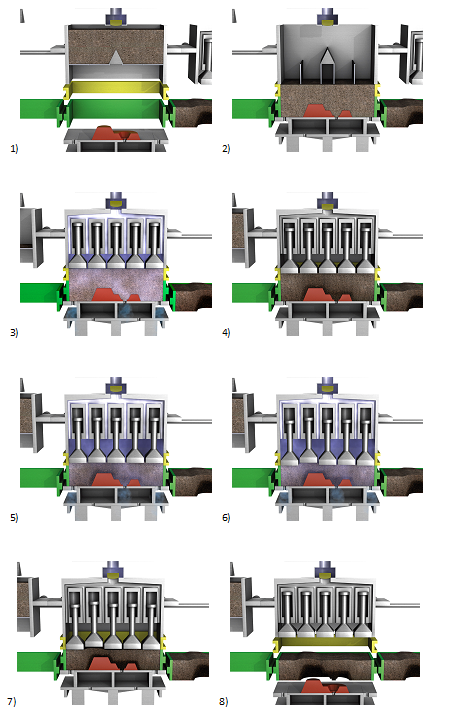 The illustration depicts a mould which was first pre-compacted and then subjected to mechanical final compaction. The strength values measured decrease, the closer one gets to the pattern plate. The reason for this: frictional forces on the surface of the pattern and the flask wall reduce the force as the force transmission path increases in length. This gradual reduction in strength is caused by conduction of force through the moulding sand at the angle of repose of the moulding sand. A finite component of this force is diverted to the surfaces bordering the sides of the moulding sand, i.e. the flask wall and the pattern contours. This causes the gradual decrease in force over the transmission path (Fig. 2 Künkel Wagner Germany GmbH). This variation in mould strength, i.e. higher mould strength on the rear side and lower mould strength on the pattern side is a disadvantage. Various pre-compaction processes have been developed and commercially introduced in an attempt to remediate the situation. Shoot squeezing is a multi-stage compaction processes and is characterized by the method of shooting the molding material (which was fluidized by means of compressed air) out of the storage tank into the mold box or the mold chamber (with boxless molding processes) through one or more sand blowing slots. The air flowing into the mold during shooting escapes through air vents. During subsequent final compaction through squeezing, the mold obtains its required density and strength. The overall range of molding machinery can be classified in three categories, namely boxless, vertical mold parting; boxless, horizontal mold parting; and horizontal mold parting with boxes. 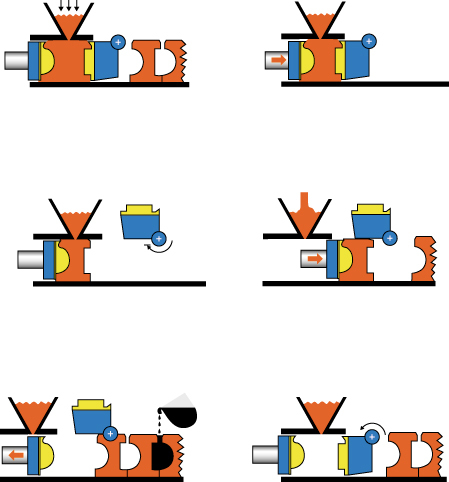 The process sequence during manufacturing of boxless, vertically parted molds is illustrated in Fig. 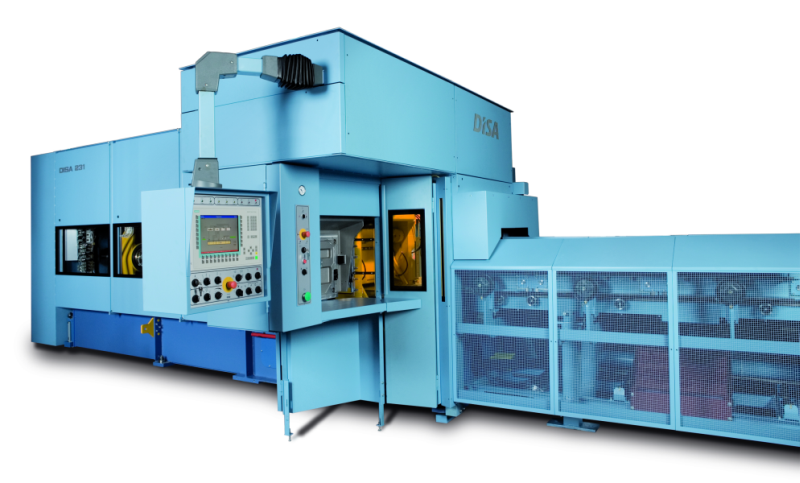 7 (DISA Industries A/S) and generally applies to all molding plants handling continuous mold strands. A typical feature for boxless molding plants with vertical parting is that the mold parts produced generally have a profile on both sides. To this end, patterns are mounted both to the squeeze and to the swivel plate. With the help of these patterns and plates the mold chamber is closed from the rear and the face side prior to the filling and compaction process. Subsequently, shooting of the mold material into the mold chamber is performed. To promote transport of the molding material into very complicated molding sections and to ensure venting of air, slots are inserted into the pattern plates so that directed filling is possible. 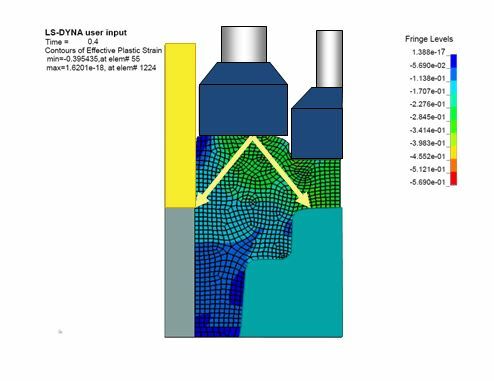 Subsequent squeezing in older-generation plants is normally exclusively performed from the back of the mold with the pattern contours being pressed into the molding material from the squeeze plate side. More modern molding machines mostly also provide the possibility of two-sided independent compaction. In the next step, the swivel plate is removed by moving it towards the face side and travels upwards in a rotary movement. The mold cod is pushed by the squeeze plate towards the previously produced mold cod so that the mold in the cod strand completed last and the first half for the next mold are produced simultaneously. In this way a mold strand is obtained, which is continuously moved forwards. Then, the squeeze plate is removed and travels backwards while the mold positioned underneath the casting unit is filled. After cleaning the pattern plates, the mold chamber is closed by means of the swivel plate and the production cycle is repeated. To prevent adhesion of molding material to the pattern, the pattern plates are heated and to facilitate removal they are sprayed. Production of vertically parted molds using the shoot squeeze molding process is characterized by short travel distances. 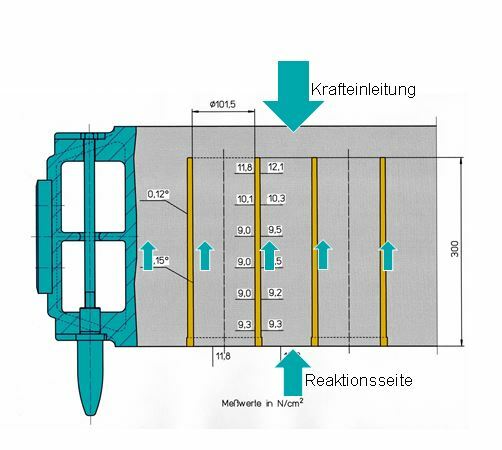 This factor makes mold box transport unnecessary and thus results in short cycle times and higher molding outputs than is achieved with box mold production (Fig. 8,9 and Movie 1, DISA Industries A/S). Fig. 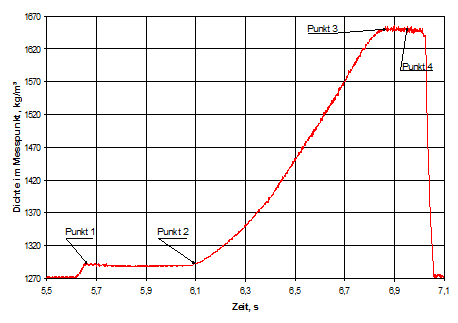 10 depicts a compaction curve that is typical for shoot squeeze molding plants. During the sand filling step, the mixture consisting of molding material and air is shot into the compaction chamber of the plant. During this step the molding material is pre-compacted. With the filling recipe set in this example, the molding material was pre-compacted to 1280 - 1300 kg/m³ (point 1 in Figure 10). This filling and compaction phase is very short. Subsequently, i.e. approx. 0.44 seconds later, the squeeze phase of the compaction process is initiated (point 2). The squeeze phase lasts around 0.77 sec. ; subsequently the squeeze pressure is kept constant for 0,1 sec. (up to point 3). In point 4 the squeeze press was relieved and after a dwell time of approx. 0.06 sec. the pattern was separated from the mold. Airflow squeeze molding was invented in the late 70s of the 20th century in Japan and since the early 80s it has been predominantly used for production of horizontal box molds in green sand molding processes. During the first cycle of the mold production process, the mold box is filled with molding material. The filling of the sand into the mold compartment formed by means of the pattern plate / pattern plate carrier, mold box, and filling frame takes place via a bin discharge conveyor or with the help of a dosing unit using the gravity effect. Then, the compaction head is positioned above the mold compartment. By lifting the machine table, the mold compartment is hermetically sealed. Subsequently, the mold is compacted by briefly subjecting the molding material tu compressed air. During this sequence, the air flows through the molding material and is vented through the nozzles in the pattern plate and/or directly in the pattern and on through the pattern plate carrier. Subsequently, the mold is finally compacted by squeezing. The process sequence is illustrated in Fig. 11. According to manufacturer’s information, the effect of the air flow in the SEIATSU technology is to induce a force onto every single grain of sand in top-down direction so that the sand, carried by the air flow, can advance into deeper sections of the pattern. And simultaneously, the gaps and spaces between the individual grains of sand are reduced. Consequently, compaction of the sand is increased in flow direction, which results in the greatest compaction effect occurring in the lower mold sections. Consequently, during compaction the sand grains are moved and whirled by the air flow for a specific period until a balance is obtained between the force generated through pressure admission and the resistance force of the molding material (resulting from forces of cohesion and friction among the individual sand grains). In this way, the molding material is transported into the various, more or less complex sections and pre-compacted. Fig. 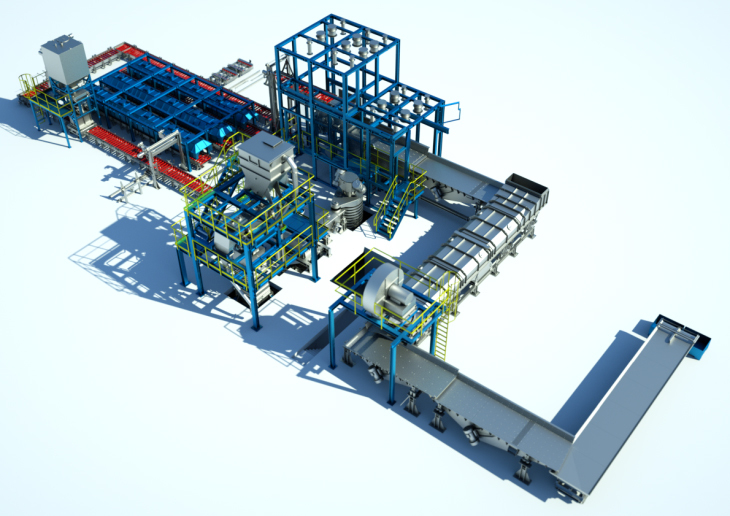 12 (Küttner GmbH & Co. KG) shows a moulding plant with sand regeneration, castings/sand separation and cooling.